Add an all-occasion, soccer greeting card to your Soccer Rose order! Featuring an exclusive design by Sports Roses creator Mark Ellingson. 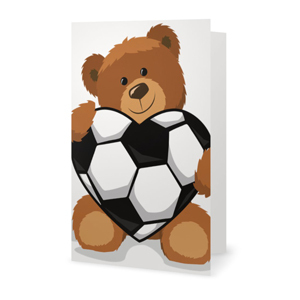 The standard size bi-fold card measures 5"x7" and features a cute teddy bear holding a soccer heart on the outside. The inside of the card has been left blank, allowing you to write in your own special message to the card. We can also print a message inside the card for you at no additional charge. 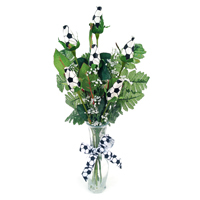 Send a bouquet of everlasting Soccer Roses to a special soccer sweetheart.